The concrete flooring in your California home may perform its basic functions, but chances are that it provides little benefit beyond that. Additionally, long-term wear and tear placed on your slabs will eventually require upkeep to retain their original glory. One way to protect your surfaces and enhance their beauty is to invest in concrete floor coating services. 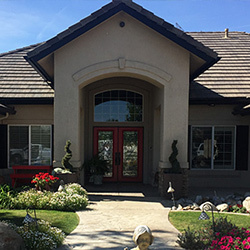 Many Californians looking for a quality concrete finish in the Bakersfield area are surprised to learn that their long-time house painters, Steve Holloway Painting, are available to create amazing outcomes that are long-lasting and affordable. From garage floor paint and flakes to epoxy flooring solutions, our local painting company is here to get the job done. Before you call, you may have reservations about the true value of investing in a coating for your concrete flooring. Read on to learn about a few benefits of our floor coating services before contacting us for your estimate! If you want your concrete flooring to shine day-in and day-out, materials such as epoxy flooring can prove invaluable. Simply put, a fresh floor coating will provide a smooth, seamless finish that helps to reflect the area’s natural light. Homeowners looking to enhance their outdoor living spaces can triple the brightness of the area with a high-gloss finish. Ultimately, this can provide more eco-friendly benefits for your property (which we will cover next time). The concrete finish used in your Bakersfield home doesn’t have to conform to one boring standard. Instead, make the most of your floor system with a dynamic pattern that helps to create the best outcome for your space. Homeowners often rate the pattern and appearance of their concrete floor finishes as a major source of pride. You can combine our floor coating services with other home renovations to create a unique outcome. 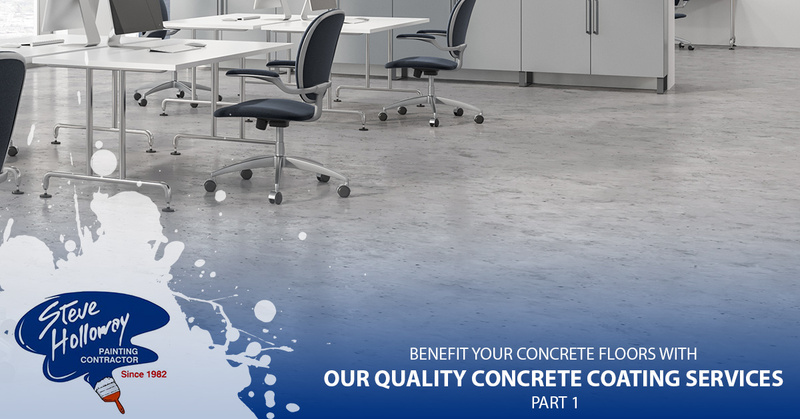 Chemicals, oils, grease, and a plethora of other components found on most concrete floors can also quickly work to erode the quality of your surface. Steve Holloway Painting is here to provide complete protection for your concrete flooring, including a variety of finishes and coatings to provide protection tailored to your needs. Car enthusiasts, stay-at-home mechanics, and even large families can benefit from the complete protection afforded by a protective floor system. There are many benefits one can expect when investing in concrete coating services, and we’ll conclude this subject in our next blog post. 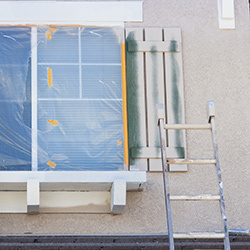 If you’re reading this post because you’re looking for quality concrete finishes for your Bakersfield home, be sure to reach out to our residential painters for assistance! 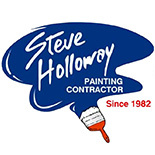 Steve Holloway Painting is here to serve as your comprehensive source for painting every surface, providing results to match your vision and meet your budget. 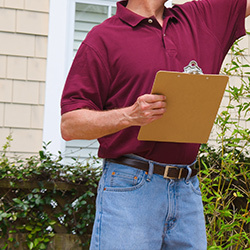 Contact us today to receive your free estimate!